Safeway has operated a grocery store at the corner of Murray and Cornell since 1967. In 1996, that store was expanded to three times its original size, taking over the space of several surrounding businesses. Now Manager Rick Edmunds is	proud to invite you to see the latest development – a complete remodeling of the interior. I found one of the most exciting features in the newly renovated store to be the seating area at the front near the west door. This is adjacent to the new Starbuck’s and the greatly expanded deli, so you can enjoy a coffee and a sandwich in comfort – it’s almost like adding a new restaurant to the area! Large windows make it a cheerful place – be sure to look for the rack with The Cedar Mill News. This Safeway is definitely following the trend to upscale environment and expanded food choices. The deli has a large variety of hot food available in addition to salads and sandwiches, and offers catering. On the west wall of the store there’s a rack full of artisan breads, a counter with a great variety of cheeses, an olive bar, a good selection of local wine and beer, and the bakery. Across the back are the dairy cooler and the meat and fish counters. This area is greatly expanded and features specials on a blackboard and lots of good personal service. 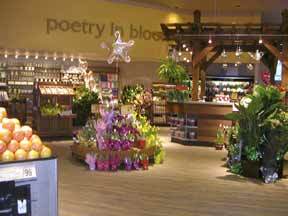 The produce area, with wood floors and mood lighting, is an enjoyable experience. There’s a wider selection of organic foods there too. Just adjacent to that is a whole row of natural foods with its own cooler/freezer section. A floral booth sits in front of a new garden store alcove. Safeway continues to offer a wide selection of grocery items, both Safeway branded	products and the national brands you’d expect. Their Customer Service counter, at the front of the store, hasn’t changed much and still offers Western Union, Ticketmaster, stamps and money orders, faxing, lottery games, and film processing. Recyclers will be happy to learn that can recycling is now indoors. 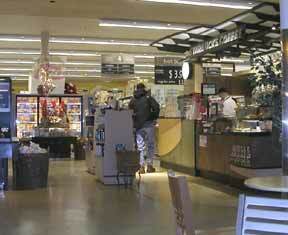 Cedar Mill’s Safeway was one of the first in the nation to offer online shopping. 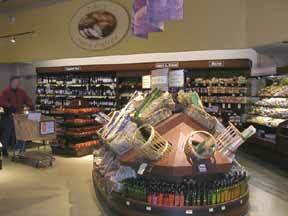 Customers can go to safeway.com and browse the digital aisles, fill their “carts” and schedule delivery – often on the same day depending when they visit. The site has improved greatly since it was first offered, in part due to the input of Cedar Mill customers. Rick Edmunds, store manager, has been with Safeway for 29 years and has managed	this store for 15 years. He’s been a member of the Cedar Mill Business Association for six years, and finds the contact with other business owners rewarding. He’d like to see more businesses get involved.